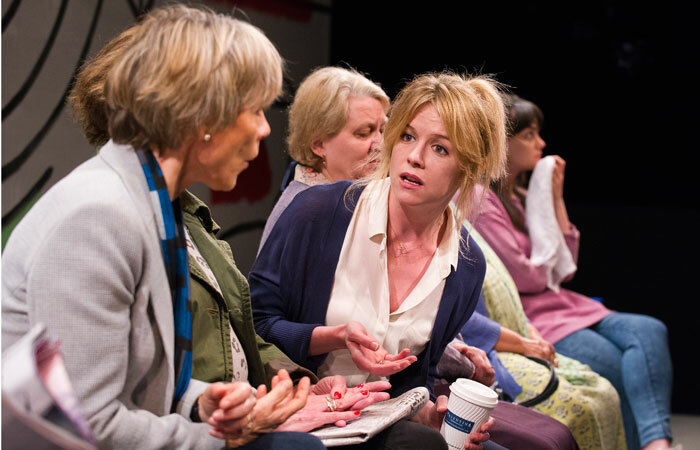 Written as a kind of chorus, Peter Gill’s production of his own play – premiering at the Print Room – is less an exercise in stream of consciousness than a collection of brackish rivulets. Eight women of differing ages and backgrounds sit upon the stage. Some of them might be the mother of others; it’s never clear because the text, as written, is intentionally fragmented and repetitious – a drifting thing. The characters are forever walking through parks, markets and churchyards, looking at other women, losing themselves in memory. But Gill has not found a form to make this delicate halting thought–music work on the stage. The production is maddeningly static and abstract. And the cast don’t appear to have got to grips with it either, the lines flow uneasily and unsteadily, the rhythms and delivery are often awkward, the words threatening to elude them entirely at times: some lines are stumbled over, some are dropped altogether. Occasionally the performers will rise and reseat themselves in a manner which resembles a party game without the party. In fact, an absence of action, of any kind, comes to define the whole experience, to the point where it feels as if time itself might be in on things, colluding, the minutes stretching out like silk threads. There should be some pleasure to be gleaned in seeing an all-female cast of this kind on stage, but the production feels so very unready and after the piercing crystalline beauty of A Breakfast of Eels in the same venue, it’s a real comedown.